What Is A Multiples Price Boost? Besides regular price boosts that can be layed easily like “Real Madrid to win”, bookies often have price boosts for multiples (accas). For example, currently, Sky offer at least 3 multiple price boosts per week, and many other bookies also offer them on a regular basis. An example of a multiple price boost is “Real Madrid, PSG and Chelsea to win”. We can take advantage of this to make a risk-free profit as well, although it may not be as simple to lay. Are Multiples Price Boosts Profitable? Yes they can be as profitable as regular price boosts! However, there are a few things you will need to consider before taking on a multiple price boost. Usually, a multiple price boost has high odds, and laying them may require a large liability, so you make sure you have enough money to lay the entire acca. When using the lay sequential method, explained below, the football games or horse races in the multiple price boost must be played at different times. If any of the games in the price boost overlap with each other, you will not be able to lay the price boost, and will have to skip that price boost. This does not apply when laying the multiple price boost using an accumulator lay market at one of the exchanges. To check the boosted back odds are great than the lay odds, we need to calculate the multiple lay odds! To do this, multiply all the lay odds of the selections and compare them with the price boost’s odds. If the combined lay odds are lower, then it is profitable! For an example, Coral is running a multiple price boost, “Real Madrid, Chelsea and Juventus to win at 6.0”. The lay odds these selections are Real Madrid 1.5, Chelsea 1.6 and Juventus is 2.5. The lay odds would be 1.5 x 1.6 x 2.0 = 4.8, which is lower than the price boost’s odds of 6.0. That means this price boost is profitable! 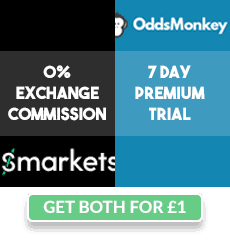 Betfair, Smarkets and Matchbook have all begun to regularly build accumulator markets on their own exchanges. This is incredibly useful for us when looking to profit from multiple price boosts. For example, Betfred offered a price boost of Watford, Tottenham and Luton all to win, boosted to 4.5. Using the lay sequential method, as discussed below, would not be possible for this boost, because the games are all being played at the same time. However, we can still profit from this offer if one of the betting exchanges is offering a lay market for this treble, and the lay odds are lower than the back odds of 4.5. In this example, we can see Smarkets are offering a lay market for this boost, with current lay odds of 4.1. Once we have found our lay market, we can open the Team Profit calculator, and treat this as a normal bet, entering our stake, the back odds of 4.5 and the lay odds of 4.1. The bookie will likely have set a max stake which we can use, or if this is higher than your bankroll will allow, you can choose to use a lower stake. Based upon a £20 stake at Betfred at odds of 4.5, we can see that we need to lay £21.95 at 4.1 (assuming 0% commission), resulting in a profit of £1.95. The lay sequential method is an alternative method of laying multiple price boosts, where you need to lay the teams, one at a time, before each game kicks off. As previously mentioned, this method is only possible when each leg of the accumulator does not overlap at all. Note if one of your teams lose, then you don't need to continue to lay the remaining team(s) as your bookmaker bet has lost! You will have made a profit risk free because your lay stake will be greater than the bookmaker bet. In this calculator, enter the back stake, the back odds, how many legs (games) there are in the multiple, and then enter the lay odds and commission percentage for each of the legs within the multiple, in the order in which each leg is being played. 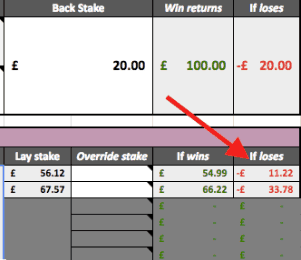 The calculator will then automatically calculate your lay stake for each leg of the sequential lay. If the price boost has 2 selection, it is a double, and if there are 3 selections, it’s a treble, and so on. Optional - you can enter the name of the events under cells D4 – D6 and your outcome in E4 - E6. Enter the events in an order of time, with the earliest game first. The profit risk free you’ll make from this multiple price boost will be displayed in cell R11. You can check out your profits table in cell R21 onwards. The lay stakes will be calculated for you in cell J13-J18. Lay the first game first, and if the first selection of your multiple price boost wins, lay the second game. And if the second selection wins, lay the third if there’s a third selection. If a selection loses, you’d already have your risk-free profit from this multiple price boost and there’s no need to lay any further. Make sure you have enough money to lay your multiple price boost. You can check how much money you’d need under the “If loses” cell in the spreadsheet under cells N13-N18. Make sure you have enough money in your exchange to cover all the “If loses” amount. In this screenshot, this means I would need to have £11.22 + £33.78 = £45 to completely lay my multiple price boost. What Happens If The Lay Odds Change? Sometimes, for the second or third game the lay odds for a selection might change between the time you place the bet on the price boost and the time the game starts. If the lay odds change, simply change the values to the new lay odds under “lay odds” in the spreadsheet (cells F13-F18), and a new lay stake will be calculated for you. Don’t worry that you’ll lose money, as most of the time the lay odds will only move a little, from 0.02 to 0.1. Sometimes the lay odds might even move downwards, making you more risk-free profit from this multiple price boost!